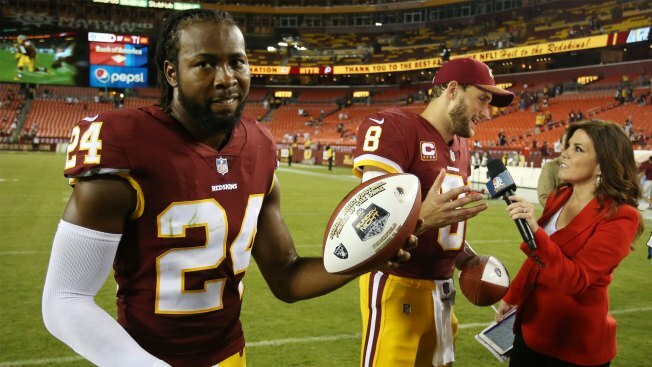 Josh Norman isn't afraid to speak his mind, especially about opposing receivers who he feels slight him in some way. Raiders wideouts Michael Crabtree and Amari Cooper were his latest targets, subjects of a postgame rant following Washington's 27-10 victory over the Silver and Black. Washington's premier cornerback said the duo talked trash to him during pregame warmups about big numbers they planned to post against Washington's secondary. That didn't happen in an awful day for the Raiders offense. Crabtree had one seven-yard catch on the night and two drops. Cooper was even worse, with a six-yard catch on five targets and a crucial drop. That gave Norman license to fire at the typically reserved Raiders receiving corps. Norman says he took the pregame exchange personally. "What was personal, other than them getting their tails whupped?" Norman said, with quotes via ESPN.com. "I mean, first and foremost, you don't come up in here and say what you're going to put up on somebody. Two hundred yards? (Crabtree) didn't catch two balls. He only caught one, huh? So please, whatever you do, do not run your mouth if you're a wide receiver and expect to show up on Sundays, because I'm telling you, we are here and we are waiting. It's hard to imagine the quiet, often stoic Cooper inciting a rivalry with words. Crabtree has had a previous squabble with Seahawks corner Richard Sherman back when he was with the 49ers, but even he's typically quiet during the course of a game. "Sherm was right," Norman said. "(Crabtree) ain't going to say he's sorry, but I don't think he's sorry," Norman said. "He sucked, to be honest with you. You don't come out here and do that extra stuff, man. We don't play that out here." Norman had several public exchanges with rival receivers, and may find motivation from these beefs.